Healers Wheel is a type of meditation used for attuning and balancing your chakras, as well as healing the self and others. It’s important that your chakras remain clear and balanced. Sometimes certain life events, like illness or trauma, can block your chakras causing your natural energy to flow improperly. When this happens your chakras aren’t balanced. You can feel tired, emotionally unstable, have a spiritual crisis, even sick or pained. There are so many symptoms I can’t name them all here. That’s another article entirely. Suffice to say, it’s a good idea to do this often to keep your chakras clear and healthy. The Healers Wheel Meditation involves a process called Toning. Toning is a kind of free form singing. There aren’t any words just sound. There is no right note, you don’t have to worry about being on key. A Healers Wheel is usually done in a group but you can adapt it to solitary use if needed. You can think of this as a guided meditation. For the purpose of this meditation I will be speaking as if to a single person instead of the group. When it comes to toning, you will vocalize a sound and continue to vocalize that sound until you run out of breath. If needed you can continue to vocalize until you get the desired effect. It a group setting, no one will notice if you stop toning or how you sound when you start doing it. They won’t notice if you stop and start up again. Everyone has a different lung capacity so their breath may last longer or not as long as yours. Just remember to concentrate on yourself and you’ll do fine. Sit or lay down and get comfortable. Turn off most lights or all if you have some candles lit. You don’t want it to be complete darkness. Close your eyes. Breathe in to the count of 4, hold to the count of 2, exhale to the count of 4 and hold to the count of 2. Continue breathing in this manner for a few moments. While breathing deeply still, imagine a cloud of white celestial light. Imagine this cloud of white celestial light is right above your head. Feel the celestial energy enter your body through the top of your head and continue through the rest of your body. Feel yourself filled with this white light. Feel the energy clearing out any negativity left. Now feel the Earth beneath you. Mother Earth. Imagine your feet are like the roots of a great tree. Feel them dig into the Earth. Feel them go deep into the Earth’s core. Feel the green healing energy of Mother Earth. Imagine this energy filling your feet. Feel it working up your legs, filling your abdomen, spreading to your arms and finally to your head. Feel this green healing energy fill your body. Allow the healing energy to take away any hurts that you might have. Feel its warmth. Allow the green healing Earth energy to fill your Aura. Feel it surround your body in a warm fluid current of healing energy. Expand that energy and allow it to mingle with other energies close to you. Allow it to fill your surrounding with green healing energy. Give yourself a moment to feel this warm healing energy surrounding everything. Now we’ll open our Chakras using tones. For each Chakra we will tone for two long breaths. Begin with your Root Chakra. This is located at the base of your spine, right around your tail bone. Visualize a ball of swirling red energy. Tone with the deepest “UH” as in “cup”, a very low guttural sound. Tone for as long as you have breath. If you feel the need, take a deep breath and tone again. You should feel a release as you really get into it. This is your chakra opening and attuning itself. Move on to the next chakra when you’re ready. The Second or Sacral Chakra is located about 2-3 inches below the navel. Visualize a swirling ball of orange energy and tone using a higher pitched but still deep “OOH” as in “you”. Continue toning until you feel ready to move on to the next chakra. The Third or Solar Plexus Chakra is located just above the navel. Visualize a bright yellow ball of swirling energy and tone using a higher pitched “OH” as in “go”. Continue toning until you feel ready to move on to the next chakra. The Fourth or Heart Chakra is located in the center of the chest. Visualize a ball of green swirling energy and tone using a higher pitched “AH” as in “paw”. 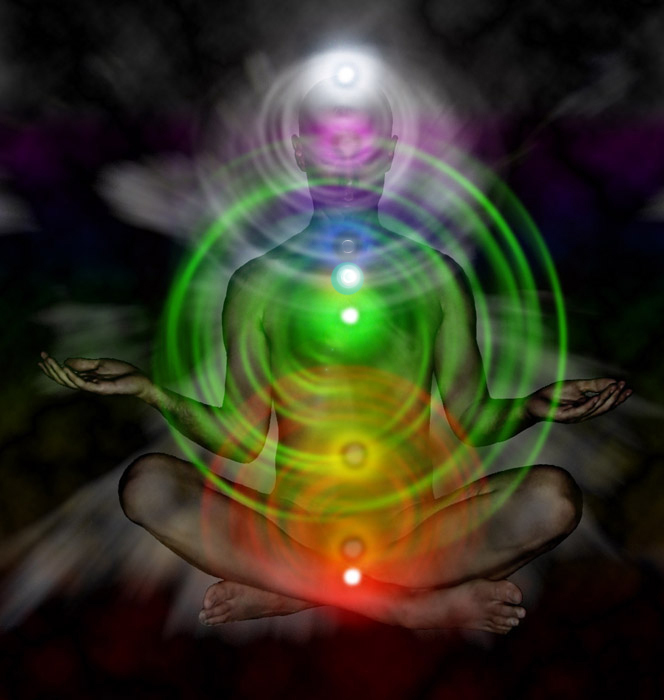 Continue toning until you feel ready to move on to the next chakra. The Fifth or Throat Chakra is located in the throat area. Visualize a bright blue swirling ball of energy and tone using a higher pitched “EYE” as in “my”. Continue toning until you feel ready to move on to the next chakra. The Third Eye Chakra, Sixth Chakra, is located in the middle of the forehead slightly above the eyes. Visualize a ball of Indigo swirling energy and tone using a still higher “AY” as in “say”. Continue toning until you feel ready to move on to the next chakra. The Crown Chakra is the Seventh Chakra and it is located slightly above the head. Visualize a purple or white ball of swirling energy and tone using the highest pitched “EEE” sound as in “me”. Only tone as high as is comfortable. Do not strain yourself. Continue toning until you feel ready to move on to the next chakra. Take a moment to gather your breath. Use this time to invite any spirit guides to your side. They may offer their energy to yours. Say a prayer to Deity or Spirit. Give them thanks and ask them to aid you. Now is the time to use your opened awareness to concentrate any energy on specific healing or other matters that need some positive energy. You would concentrate on the subject and tone. Say a prayer or blessing for the person or subject you would like to send healing energy to. When done with your blessing or prayer begin to tone. It does not matter what you tone or what sound you make, only that you are toning and making sounds. It doesn’t matter what you vocalize, it doesn’t matter if you stay on the same pitch. It is all about the energy and intent behind it. Continue to tone for as long as is comfortable for you. Focus any energy raised into that person or subject you wish to convey healing energy to. You can focus the healing energy into an object to be given to that person if they aren’t present. After you are done toning, clear and release as always. Thank Deity or Spirit. Thank your guides for accompanying you. Remember to close your Chakras. You can do this by toning them in reverse order, imagining a door closing over each chakra or a flower closing it’s petals together. Picture the swirling energy slowly coming to a stop. Ground any excess energy and you have completed the Healers Wheel meditation. Anytime you feel the need of healing energy in your life. Take three deep breaths and the energy will be there.